A great way to raise awareness of hemiplegic cerebral palsy, pediatric stroke, or related conditions is to set up a display or booth at your local Fall Festivals. Most communities or schools have some sort of festival in the fall and there’s usually no charge for participation. 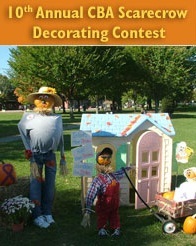 CHASA Volunteer Annette Brennan came up with this idea several years ago and you can see the display she built for a Scarecrow Decorating Contest in her community. You can see the signs that Annette added throughout her display. A big thank you to Annette for spreading the word about stroke in babies and hemiplegic cerebral palsy.